Reveal Ductless Downflow Workstation - 36"
The Reveal Ductless Downflow Workstations offer 270° visibility, with both the sides and front of the stations open for easy, unobstructed access. The perforated stainless steel work surface protects a polypropylene tray for containing spills while a vapor-proof fluorescent lamp provides focused lighting for the operator. A conveniently located control panel contains fan and light switches, the airflow alarm warning window, and an hour counter, allowing self-determination of the appropriate settings. 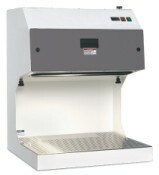 Constructed of sturdy metal, these professional quality downflow workstations meet or exceed OSHA, ANSI, and other international standards, providing operators with security as they work with these units. Because the stations are completely self-contained, they do not require the additional costs of expanding ducts or HVAC units, allowing for quick set-up and use in multiple locations. The ductless technology is eco-friendly, capturing vapors in the Multiplex™ Filtration System and preventing their release into the environment. Because they are ductless, with the addition of an optional mobile cart, the Reveal Ductless Downflow Workstations can easily be moved throughout your laboratory as needed. The Reveal Ductless Downflow Workstations use the Multiplex™ Filtration System, professionally designed to protect the operator from hazardous vapors. A face velocity of 80FPM at the work surface is normal while an activated carbon filter absorbs vapors and particulates to guarantee clean air is returned to the room. An electrostatic filter located under the work surface can be changed while the unit is running. Activated carbon and/or HEPA filter(s) in the top of the workstation are kept sealed by a patented filter clamping mechanism, preventing bypass leakage. For longer workstation life, fumes are kept separate from internal cabinet parts. With our units, there is no need to purchase initial filters; each cabinet is supplied with its own specially selected filters so your Downflow Workstation is ready for use when you receive it. * Shipping charges on Laboratory Equipment will be determined when items are ready to ship.